The shale revolution has changed the North American energy landscape dramatically over the past five years, enabling the US to grow its annual crude-oil output for the first time in decades and overtake Russia as the world’s leading producer of natural gas. However, these positive developments have come with their fair share of growing pains and volatility, as the nation’s midstream and downstream operators seek to play catch up with this production growth. 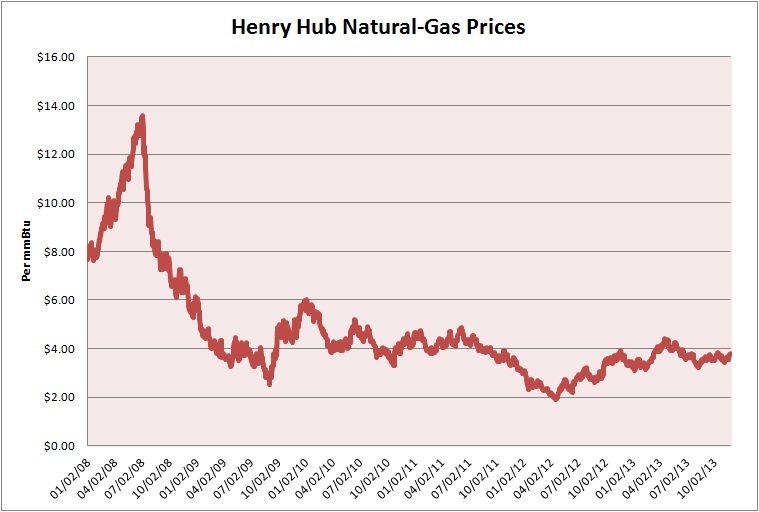 Consider the price of natural gas at Louisiana’s Henry Hub, which peaked at $13.69 per million British thermal units (mmBtu) in July 2008 and has ranged between $$3.00 and $4.50 per mmBtu over the past year. Surging production of natural gas from the nation’s prolific shale plays overwhelmed domestic demand, depressing the price of this commodity to less than $2.00 per mmBtu when consumption cratered during the no-show winter of 2011-12. This supply overhang has also compressed seasonal price differentials, a huge challenge for Niska Gas Storage Partners LLC (NYSE: NKA) and others that own natural-gas storage capacity. Meanwhile, America’s gas glut and the build-out of regional pipeline networks have also reduced the price spreads between various geographic hubs, eroding demand for capacity on long-haul pipelines that transport the commodity. Boardwalk Energy Partners LP (NYSE: BWP), for example, this year faces about $40 million worth of contract expirations on its long-distance pipelines; weak demand for this capacity has weighed heavily on the master limited partnership’s (MLP) distributable cash flow. Similar trends have emerged in the North American market for natural gas liquids (NGL), a group of hydrocarbons that includes ethane, propane, butane and natural gasoline. As we explained in Another Leg Down for NGL Prices and NGL Price Update: The Lighter End of the Barrel, surging production of ethane and propane–the two most prominent NGLs by volume–has outstripped domestic demand. Although increasing export volumes have helped to bolster propane prices this year, the price of ethane should remain depressed until new petrochemical facilities that use this hydrocarbon as a feedstock come onstream in a few years. Weak NGL prices have been a persistent headwind for producers such as Linn Energy LLC (NSDQ: LINE) and companies that own and operate gas gathering and processing systems under keep-whole and percent-of-proceeds contracts. The shale oil and gas revolution has also roiled North America’s crude-oil markets. 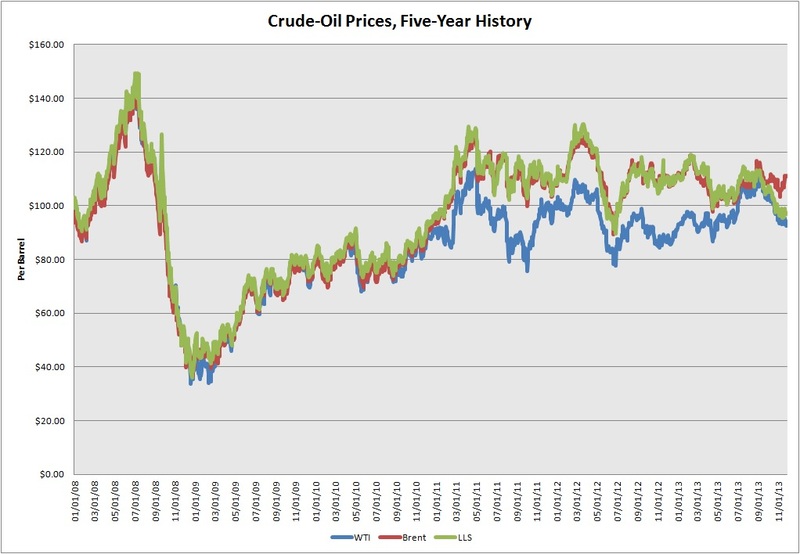 In late 2010, the historical price differential between West Texas Intermediate (WTI) and Brent crude oil started to widen dramatically because of local logistical constrains and an uptick in volumes arriving at the hub in Cushing, Okla., the delivery point for WTI. 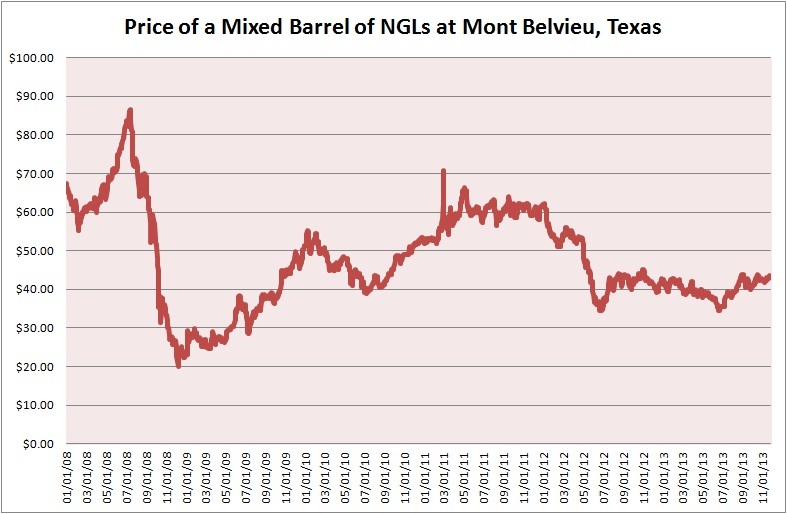 An influx of crude oil from the Bakken Shale and western Canada, coupled with insufficient southbound takeaway capacity from Cushing to the Gulf Coast’s refinery complex, resulted in a growing supply glut that depressed the price of WTI relative to Brent and other benchmarks that reflect global supply and demand conditions. However, as we explained in Getting Back Together, the spread between these two oil benchmarks narrowed over the summer, reflecting the start-up of several pipeline projects. At one point in mid-July, WTI crude oil even traded at a premium of $0.08 per barrel to Brent. But the convergence of these two crude-oil benchmarks proved fleeting; WTI now trades at a discount of $13.09 per barrel as of Oct. 30, 2013. For the first time, this weakness has extended to Light Louisiana Sweet (LLS) crude oil, a coastal benchmark that traditionally has tracked the price of Brent crude oil because it competes with seaborne imports from international markets. Each earnings season, we look forward to poring over quarterly results from the big four oil-field services companies–Schlumberger (NYSE: SLB), Halliburton (NYSE: HAL), Baker Hughes (NYSE: BHI) and Weatherford International (NYSE: WFT). The big four’s conference calls to discuss quarterly earnings–particularly the wide–ranging calls hosted by Schlumberger, the world’s largest oil-field services company––provide invaluable insights into other aspects of the energy patch. In the past, closely listening to Schlumberger’s quarterly conference calls has helped us to profit from rapidly improving margins in the marine-seismic services segment in 2010 and to avoid much of the fallout from the collapse in pressure-pumping prices that occurred in 2012. The read-throughs from Schlumberger and the other major oil-field services companies’ earnings reports and subsequent conference calls are particularly useful because they occur before many other energy-related names announce quarterly results. In the MLP space, we look to commentary from the management teams at Enterprise Products Partners LP (NYSE: EPD) and Plains All American Pipeline LP (NYSE: PAA) for insights into the direction of North American commodity prices and emerging opportunities throughout the energy value chain. Not only are these publicly traded partnerships foundational holdings of any energy portfolio (when they trade below our buy targets), but also their management teams have proved particularly prescient about bigger-picture developments–and how to profit from them. This candor and insight stand out against other management teams that tend to emphasize company-specific projects and anticipated distribution growth with scant reference to trends in the industry at large. Not surprisingly, Enterprise Products Partners and Plains All American Pipeline routinely draw the biggest crowds at the National Association of Publicly Trades Partnerships’ annual MLP investor conference–an event that we attend every year. The largest publicly traded partnership by market capitalization, Enterprise Products Partners boasts an unparalleled asset base in terms of its geographic diversity and interconnections. Enterprise Products Partners is also helmed by a prescient management team that always seems to be ahead of the crowd–one of the main reasons that the partnership has increased its distribution in 37 consecutive quarters. Most recently, Enterprise Products Partners was the first to develop the capacity to export significant volumes of propane and butane as a hedge against lower NGL prices. This rapidly expanding business, coupled with an upsurge in gas-processing volumes at its new plants in the Eagle Ford Shale, helped to offset weaker NGL volumes in the Midcontinent region. Simply put, Enterprise Products Partners’ balanced portfolio of midstream infrastructure and exposure to a wide range of hydrocabons gives CEO James Teague and his team deep insight into key trends driving North America’s energy markets. Here are some of the key takeaways from Enterprise Products Partners’ recent earnings calls and analyst meetings. Natural Gas: Forecast calls for US to produce 84.1 billion cubic feet per day (Bcf/d) of natural gas by 2020, an increase of 22 percent to 26 percent. However, natural-gas output is expected to grow by 2 percent to 3 percent through 2015 because of limited increases in demand. Depressed natural-gas prices shouldn’t be an impediment: Enterprise Products Partners estimates that upstream operators could add more than 25 Bcf/d in incremental production from known resources when natural gas fetched less than $5.00 per mmBtu. Management projects an increase of 11 Bcf/d to 20Bcf/d in incremental gas demand over the next five to seven years, with power generation accounting for 4 Bcf/d to 7 Bcf/d, industrial and petrochemical users accounting for 2 Bcf/d to 4 Bcf/d, exports of liquefied natural gas (LNG) accounting for 4 Bcf/d to 6 Bcf/d and residential and commercial conversions accounting for 0.5 Bcf/d to 1.5 Bcf/d. This outlook excludes rising pipeline exports to Mexico. Natural Gas Liquids: Enterprise Products Partners expects US NGL production to surge by 54 percent to 60 percent through 2015, thanks to superior price realizations relative to fields that produce primarily natural gas and rising exports of propane and butane. Management expects ethane prices to remain depressed, leading to ongoing ethane rejection in the Midcontinent region and other plays that are further from the fractionation complex on the Gulf Coast. On the plus side, higher propane prices and capacity additions in the petrochemical industry should increase demand for this NGL by 600,000 to 750,000 barrels per day. The company’s forecast also includes 100,000 barrels per day of ethane exports, though management hasn’t elaborated on this opportunity. Crude Oil: Enterprise Products Partners’ internal forecast calls for North American oil production to increase by 7.3 million barrels per day between 2008 and 2020, with Canada accounting for 2.35 million barrels per day. Refinery upgrades and additional export capacity for petroleum products will be critical to supporting domestic crude-oil output and prices. Expanding export capacity is critical to Enterprise Products Partners’ outlook for US hydrocarbon production, creating a huge opportunity set for the MLP to build the midstream and downstream assets needed to support America’s push for energy independence. Since its initial public offering in 1998, Plains All American Pipeline LP has amassed an extensive network of interconnected midstream assets that includes more than 18,000 miles of active crude-oil and refined-product pipelines, as well as extensive capabilities to move liquid hydrocarbon by rail, truck and barge. In addition to the organic growth opportunities afforded by this sprawling asset base, the MLP also boasts one of the most astute management teams in the industry. Over the past three years, Plains All American Pipeline has grown its quarterly distribution at an average annual rate of more than 7 percent, fueled by an impressive slate of organic growth projects, canny acquisitions and rising throughput on its pipelines. And the publicly traded partnership’s distribution growth has accelerated in recent quarters. The midstream operator is on course to increase its payout by more than 10 percent this year and forecasts a similar rate of expansion in 2014. For our money, CEO Greg Armstrong and his team regularly produce some of the most useful commentary on trends in North American crude-oil markets. Here are some of the key takeaways from Plains All American Pipeline’s recent earnings calls and analyst meetings. The partnership expects US and Canadian crude-oil production to increase by about 3.4 million barrels per day (about 32 percent) by 2016. This forecast assumes a consistent rig count and well results that reflect historical production. Expect light- and medium-sweet crude oils to decline to less than 5 percent of US imports by the end of 2014 from about 30 percent in 2009. Management estimates that light- and medium-sweet crude oils will account for 2.4 million barrels per day (about 70 percent) of the anticipated growth in North American crude-oil production, leading to regional imbalances and eventually a national imbalance. This forecast leads to 1 million barrels of light- and medium-sweet crude oil without a readily available market, assuming that refineries don’t make necessary upgrades to run more light-sweet crude oil. These investments would likely require commitments to lock in discounted supplies. Fluctuations in regional oil-price differentials will transition from primarily volume-related issues to quality-related imbalances, with light crude oils trading at a discount to heavy or sour crudes. In short, Enterprise Products Partners and Plains All American Pipeline’s outlooks call for more volatility in North America’s energy markets, as the shale oil and gas revolution continues to pick up steam. Amid all this upheaval, you can count on these management teams to be ahead of the curve in identifying key trends and how to profit from them.